If you have read my end of year letters in the past, you know that the holidays, for me, are a time of joy and reflection. A time to celebrate the courage and dedication of our families and friends. To fondly remember loved ones we’ve lost. To find inspiration and hope. To share with those less fortunate than ourselves. So much to be grateful for and so much to hold precious. As I look back on 2013, I am again reminded of how truly thankful I am to be part of a company that continues to be a front-runner in pet nutrition. That works to make life better for both people and their pet kids. 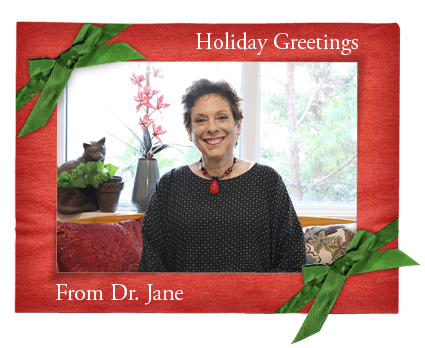 I consider it a privilege to communicate with you via emails and conference calls, as well as these blog posts that not only share valuable information but also keep you up-to-date on the important work of the Dr. Jane’s HealthyPetNet Foundation. Our non-profit wing was very active this past year. We not only continued to award grants to worthy animal rescues, but we were able to get food to relief centers in Colorado to feed hungry pets displaced by devastating flood waters. The generosity and patronage of our customers enables our foundation to continue its good works. From the bottom of my heart, I thank you ... each and every one of you. I am proud to report that we continue to lead the pet-product industry in safety and quality, and you can rest assured that everything carrying the Life’s Abundance brand is carefully tracked for the highest margin of safety. We continue to be absolutely firm in our commitment to provide safe and effective products that satisfy our customer’s high standards. From all of us here at Life’s Abundance, we wish you and yours joyous holidays and a happy New Year. Well said Dr. Jane. I am proud and grateful to be a distributor for Life's Abundance. I love the fact that I am part of providing superior nutrition for dogs and cats all over the United States. I would be thrilled if Life's Abundance could be offered to our Canadian friends. Hopefully that day may come in the future. Thank you for all you do for our furry friends. Our labs love LA products and we love how healthy they are! Thank you Dr. Jane for all the wonderful products you have formulated for us to share with others. We are going into our 11th year as distributors and are truly thankful to work with such a caring person. Here is to an even better 2014! Dr Jane, I'd love to see a blog article that summarizes ALL the rescue operations that the foundation has helped over the years! I'd love to spread the word about how far the foundation's assistance has reached--the number of rescues, the number of states involved, even the total dollar amount awarded so far!